Well, doesn't everyone stay up late to make 3 kinds of sandwiches to share with supporters after a triathlon? Yeah, I know, maybe this idea was funny just to me. The night before the Memphis in May event -- not a short sprint or relay event, dear readers, but the real deal, full-length thing -- I was supposed to be resting. With a bouquet of backyard hydrangeas in hand and alternate plans not revolving around going to sleep at eight on a Saturday night in mind, my wife departed after giving me strict instructions to go directly to bed. She also remarked that I would probably find something to do in the kitchen up until the very last minute. She was right. 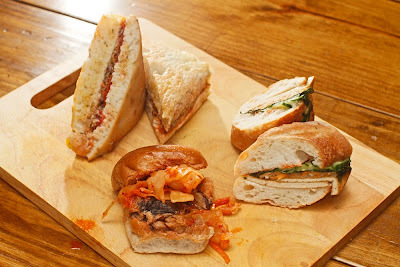 I thought toting three kinds of sandwiches for an after-tri picnic was in order: a muffaleta with oven-dried tomatoes, provolone, and olive dressing; a tofu bahn-mi with shiso; and a Korean barbecue with kimchi. The first one and the last one were both hits; for some reason, getting people to try bahn mi is a challenge, but that one at least is always a hit with me. Take a medium-sized container from the olive bar at the store and fill it 3/4 full of a mix of your favorite olives. Get it home and add all the olives plus one chopped carrot, two chopped celery stalks, and one clove of garlic to a food processor. Pulse until well-chopped. Add a pinch of crushed red pepper flakes and then return the mix to the olive bar container. Add 4 tbsp. of olive oil and return it to the fridge for an hour so that the flavors meld. 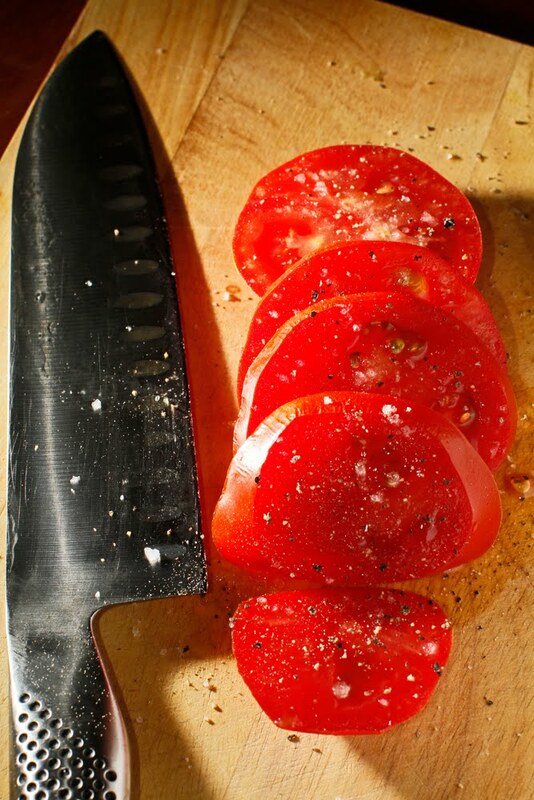 Slice tomatoes to 1/8 of an inch and put slices into a 300 degree oven for 2 hours or until they start to look dry. Remove and allow to cool completely -- if you don't, they'll fall apart! It's time to assemble your muffaleta. 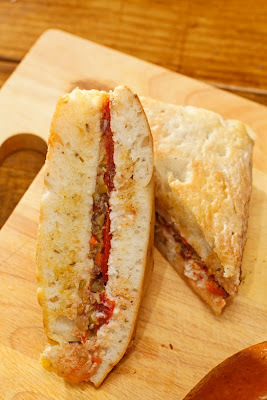 Grab a nice focaccia, split it, and place a cup of shredded provolone on one side of bread. Melt this under the broiler until it's bubbly. Next, layer the tomatoes and the olive dressing on the bread. The sweet oven-dried tomatoes act as a foil for the bitterness and saltiness of the olives. Sitting under a tree in Millington in 90-degree heat last Sunday, my friends and family thought the sandwiches made cheering me on a palatable reward. I loved the fact that even though I told them to arrive around eleven o'clock in order to have plenty of time to see me at the finish line, I surprised them and myself by already being done when they got there. I'd clocked my new record time, 3:08, an improvement over 3.30 from last May. It's no secret that I'm borderline obsessed with tomatoes. This is just another way I've figured out to get more delicious tomatoes into my already lycopene-packed diet. This recipe makes a great lunch -- especially if it is served with a slice of crusty bread to sop up all the olive oil and balsamic vinegar. This vegan version is just like the traditional caprese salad, except I have subbed sliced, firm tofu in for the buffalo mozzarella. Firm tofu and buffalo mozzarella have a similar light-tasting, milky quality. For this reason, the tofu works really well in this dish. Slice tofu and tomatoes and stack them alternately on two separate plates. Place a few basil leaves in between the stacks. 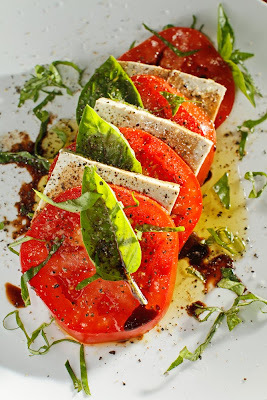 Drizzle with a good-quality olive oil and aged balsamic vinegar. Finish with sea salt, black pepper, and a ribbons of the remaining basil. If you are what you eat, then I'm likely about 12% cashew noodle salad. I've been eating it for lunch at least once a week since I was a kid. The version I love so much is an old Squash Blossom (Memphis's good old locally-owned health food store) recipe that has survived the corporate takeovers and is still served at Whole Foods today. Legend has it that it was taken off the menu once, and customers protested so much that it was returned to the deli case where it belongs. This is my version of it, which is a bit spicier than the original. 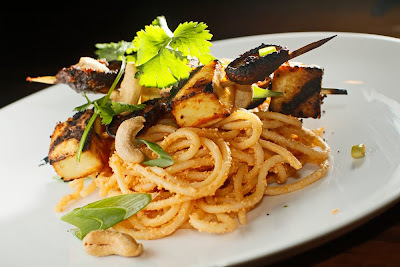 I also dressed it up for dinner with a few simple tofu and mushroom skewers. Place the first seven ingredients into a food processor and blend until smooth. Toss the cashew dressing and green onions with the cooked and cooled noodles. Garnish each serving with some whole cashews, cilantro, and more fresh green onion. This recipe makes a ton, but it keeps for a week or so in an airtight container. It tastes even better the second day. But I must warn you...this stuff is addictive. I may not even allow myself to make it anymore because I ate it all in an embarrassingly short amount of time. Seriously: watch out. My buddy Van Cheeseman of Flora Farms gave me the first ripe tomato out of his high tunnel. I hung on to that special treat for a few days all the while trying to decide what to do with it. All of a sudden, it dawned on me: go on and eat it! Slice that sucker up and top it with a little sea salt and cracked black pepper. Well, that is just what I did today. 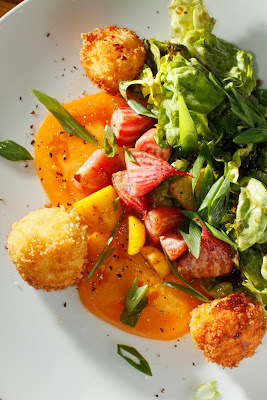 It had all the punch and acidity that you would expect from a ripe summer tomato. Delicious. I'm looking forward to taking home boxes full of Arkansas Traveler, Cherokee Purple, Jet Star, Green Zebra, and Super Nova tomatoes. We're also growing a few different varieties at home in our raised bed. 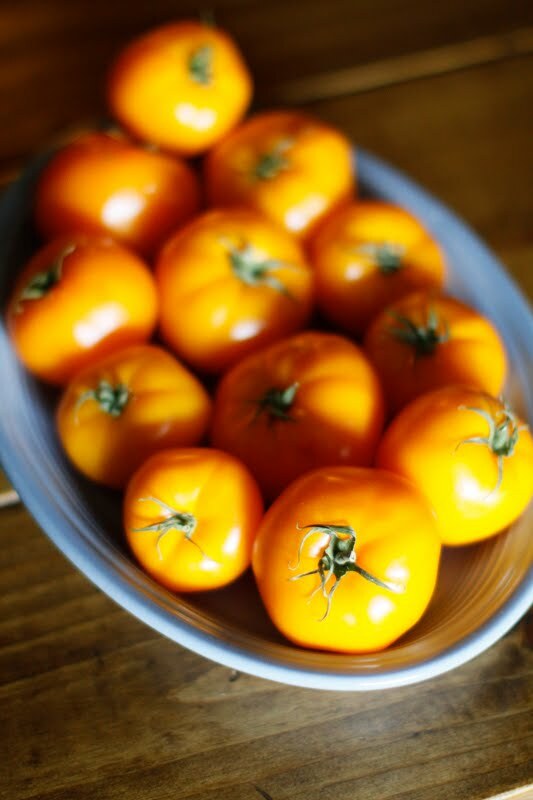 So what is your favorite tomato variety? The question I'm asked most often is: "Do you eat like that every day?" The real answer can be found HERE. My new companion blog, Platelist, is simply a catalog of the food that comes out of my kitchen on a daily basis. There will be no reveries or recipes, no stories or memories. I do hope there will be some culinary inspiration for those who choose to go meatless. So, there's some special equipment needed for this one: A 9x12-ish stainless steel pan with a shallow, perforated basket and a tight-fitting lid. I got this whole set up at a restaurant supply store for about 30 bucks. I think they call it a hotel pan. The main thing is that the large pan has to be about one inch deeper than the perforated pan so there's room for the wood chips. You'll also need an outdoor gas grill and some wood chips, which are available in most grocery stores. 1. Soak a large handful of wood chips in water (or beer...or wine...) for about 20 minutes. I prefer applewood chips, but hickory imparts a strong wood flavor, which is nice, too. 2. Drain chips and set them in the bottom of your smoker pan. Turn your grill on high. Place the smoker directly over the flame of your outdoor gas grill and leave it alone. After 8 minutes, you will notice lots of smoke coming form the chips. This is a good thing. 3. Lay peeled garlic (or anything else you want to taste smoky, for that matter) in a single layer in the smoker basket and place over smoking wood chips. 4. Cover with a tight-fitting lid and secure with a few bricks. Wait ten minutes. Remove garlic and allow it to cool. Place in an airtight container for up to two weeks. Smoked garlic is a wonderful addition to the vegetarian pantry because it adds a smoky, hearty flavor to almost anything. The cloves lose some of their garlicky qualities and act more as a vehicle for the smoke flavor. Quite frankly, smoked garlic tastes like bacon. Add it to black beans, grits, carbonara, or chili for a whole new taste experience. One of my favorite things to do with it is to mix one minced clove of smoked garlic with a few tablespoons of mayo, spread it on some bread, and add lettuce and tomato. It tastes like the BLT of your dreams. What would you do with smoked garlic? So it looks like artisanal popsicles, of all things, are where it's at. 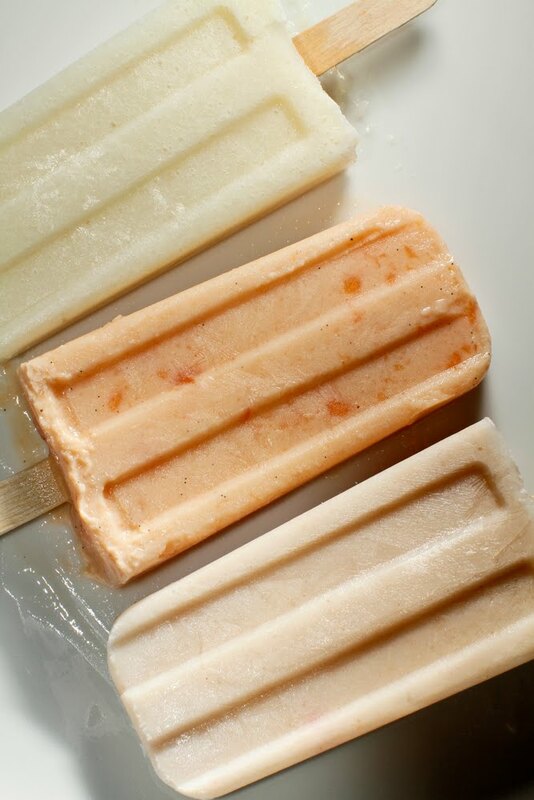 Our own 3 new flavors: strawberry-quince, Meyer lemon-Korean melon, and tangerine-papaya- peppercorn. And, as shocking as this might be, we might even tinker with some more traditional summer flavors next time around. All you need for these besides the fruit is a blender or food processor, your favorite popsicle molds, some little sticks, raw sugar, and cream-on-top vanilla yogurt. Here in Memphis, it looks like we're going to get a hint of summer with 90-degree days coming up sooner than usual, so maybe making these will get you through it. In my interview with Lidia Bastianich, I asked how she would gussy-up plain ol' panelle for a dinner party. Her answer: Treat it like polenta, top it with any in-season vegetable (specifically blanched asparagus), then add gorgonzola. Well, that' s exactly what I made last night, and it was a hit. I modified it just a bit by adding a layer of blanched asparagus and a layer of a goat cheese mixed with egg between the two layers of panelle. I guess you could call it stuffed panelle. After tasting this dish, Amelia, my 4-and-a-half year-old niece, told me, "When I'm hungry, I want to come here to eat." This is a Brame family recipe that has been handed down through the generations; on a recent Sunday afternoon, Mrs. Brame herself stopped by our kitchen and took the time to teach me how to make this time-honored family tradition called pizza chiena (pronounced 'pizza gain'.) With its flaky crust, pizza chiena is like a large empanada and is traditionally filled with ricotta, eggs, and cured ham. In this version, we subbed diced, sautéed mushrooms for the ham to make it vegetarian-friendly. 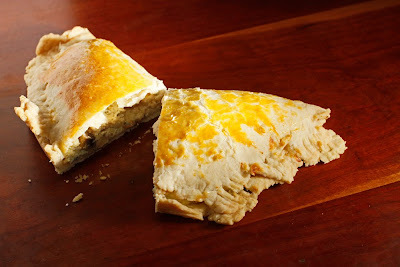 This dish, which can be served hot or at room temperature, is traditionally served at Easter supper, but I think it would be great any time of the year. Mix the first three ingredients and then add the oil. Add water a few tablespoons at a time until the dough comes together. Cover dough ball in plastic wrap and allow it to rest in the fridge for 20 minutes. Sauté mushrooms in olive oil over high heat until they give up their liquid. Add bouillon cube and cook until browned. Set aside. Mix mushrooms and remaining ingredients in a large bowl. Preheat your oven to 350 degrees. 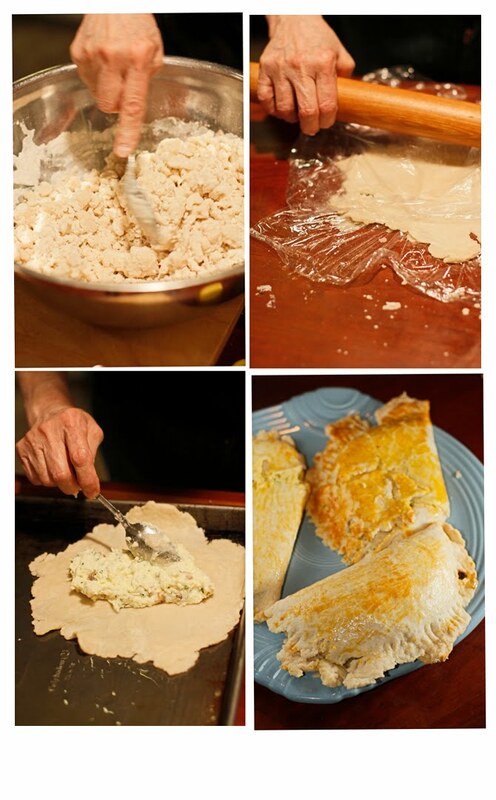 Grab a lemon-sized piece of dough, and using a rolling pin, roll it out between two large sheets of plastic wrap until it is roughly 9-10 inches in diameter. Remove top piece of plastic wrap. Spoon about a cup of the filling onto half of the dough circle. 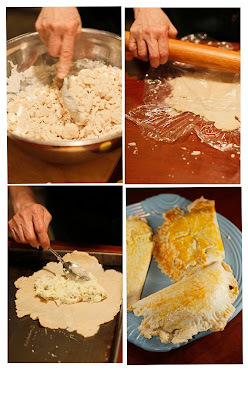 Fold the dough and press edges with a fork. Transfer to a Silpat-lined baking sheet. Repeat until you run out of everything. Brush the top of each pastry with a beaten egg yolk. (This should make about six pizzas.) Cook for 30-45 minutes. You'll know they're done when they puff up and the edges are nice and brown. 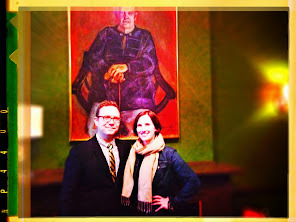 We were thrilled to be able to ask one of our favorite chefs a few questions this week! And we're over the moon about her being in Memphis this weekend. You can see her tomorrow and get your cookbook signed at this event. Support the Brooks Museum's educational programs by attending the Grand Auction this Saturday at 4 p.m.. It'll feature Italian food, wine, and the first lady of Italian cooking, Lidia Bastianich. 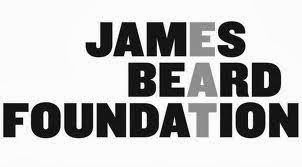 For tickets, call 544-6209 or go to www.theartofgoodtaste.org. The Chubby Vegetarian: It seems to me that it's easy to go meatless when cooking an Italian meal. You even have a section in Italian-American Kitchen devoted to vegetarian foods. Ricotta dumplings and my version of a mushroom carbonara are our weeknight standards. At the moment, what are some of your favorite meatless dishes, and which ones end up on your table most often? Care to share a recipe or two? 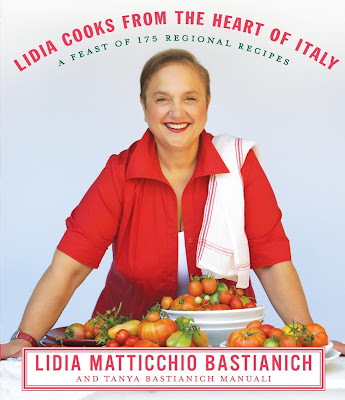 Lidia Bastianich: The Meatless Pecorino Meatballs from my new book, Lidia Cooks from the Heart of Italy, are a great example of who needs meat. In the region of Abruzzo, once a predominantly pastoral society, where cheese abounded and meat was scarce, dishes like these were commonplace. They are delicious as finger food at a party or as an appetizer--or they can be dressed up with a simple marinara sauce and served as a main course. And I am always up for a simple pasta with basil, parsley & walnut pesto as made in the region of Liguria. 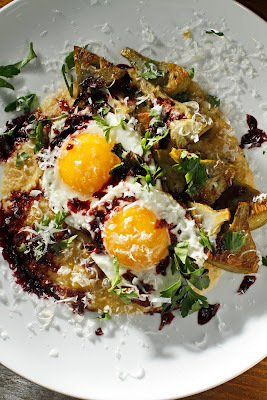 TCV: You introduced me to one of my favorites foods, panelle, and I'm eternally grateful for that. I'm considering serving panelle at a dinner party as a third course. What would you do to dress it up and make it the focus of the plate rather than the filling for a sandwich? 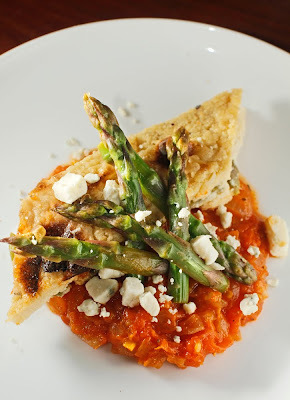 LB: You can use panelle as you would polenta, topping it with blanched asparagus and then Fontina or Gorgonzola and grill until crisp on top, or any other vegetable in season, braised artichokes in tomato, fava, peas, etc. TCV: I find it hard to talk people into making their own pasta. Most home cooks fear that they might fail. 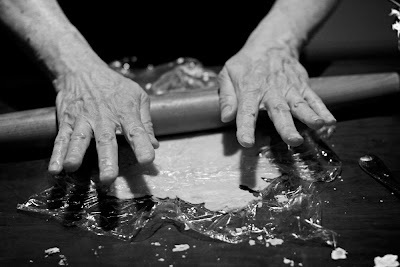 What is the one thing you would say to to encourage them to go and make their own pasta dough? LB: I always tell them to dive in! Every egg dough consists of just flour, eggs, oil, and water, and all you need is a mixing bowl, or even easier, a food processor, some counter space to roll it, and five minutes, so why not try it? It is a great family project. Once you get the hang of it, you can experiment with different types of flour, such as buckwheat, semolina or flaxseed, as well as different shapes and sauce combinations. TCV: What one dish most firmly connects you with the idea of family? LB: I love cooking my good capon stock and mother's chicken and potatoes, which is the most-requested meal by my grandkids, and all those who drop by love it. It's a dish I grew up with, and it's such a joy to have them love it, too. TCV: Like your son, I have made some tremendous changes in my lifestyle and eating habits that resulted in a 75-pound weight loss over the past year. His story was very inspiring to me. What role did you play in his transformation? LB: The onset of diabetes and knowing that he has three beautiful children that he has to be here for, he realized that it was in his court, and he took control. Daily exercise is a big part of the regime. Eating well...just eating less. This new market takes place on Saturdays from 10:00 to 1:00 in the parking lot next to First Congo. 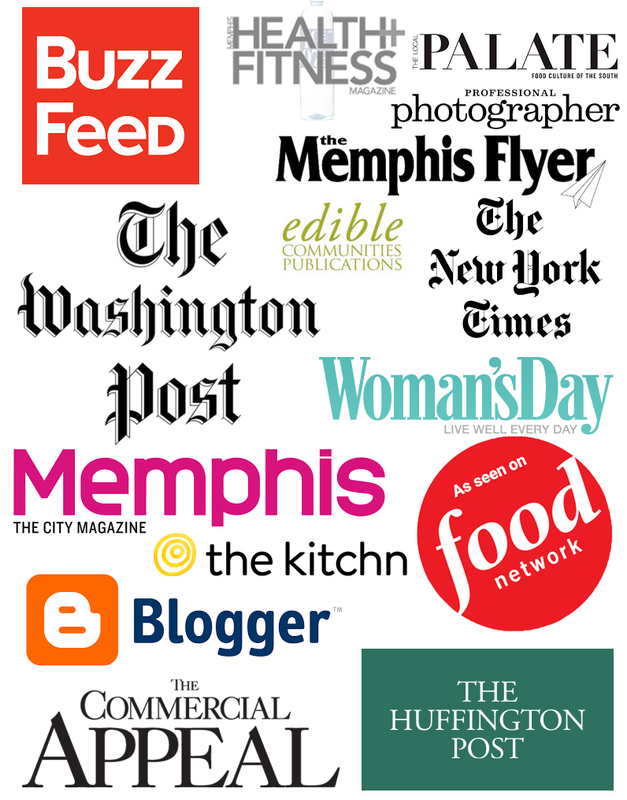 Go see what's new from Downing Hollow Farms, Grow Memphis, DeJa Vu, and other great vendors. Today, we saw a soil blocking/worm bucket compost demo, ate a vegan breakfast, and got educated about bee pollen. Loved it! The corn and garlic are blended until smooth in a food processor. That mixture and the remaining ingredients go into a saucepan so you can bring them to a boil. Reduce heat to a simmer and allow to cook for 30 minutes. Stir frequently! Season to taste. We call 'em grits in the South, but you may know this dish as polenta. No matter what you call it, the addition of fresh corn adds a nice sweetness and a creamy texture to the dish you know and love. You should give this recipe a try this summer when corn is abundant and available at your local market. Goat cheese rolled into a ball, frozen, coated in egg & bread crumbs, and fried. We LOVE the Wednesday farmer's market. Don't overlook it. Below is an essay by my close friend Aaron Brame. We spent a recent Sunday afternoon in my kitchen learning some treasured family recipes from his mom. In the coming weeks I will share those recipes with you in celebration of Mother's Day. I may have lived nearly all my life in the South, but I have never eaten like a southerner. My mother taught me all that I know about cooking and food, and she learned in the kitchen of her parents and grandparents in Jeannette, Pennsylvania. Jeannette is a grimy, industrial suburb of Pittsburgh that once boasted the largest glass factories in the world. Immigrants actually left New York City for Westmoreland County, where they could find work at the Jeannette Glass Company. Early in the twentieth century, following fateful meanderings around the globe, my family ended up there. They had dug up their tomato gardens in Calambria, Italy, and transplanted them in the hills of Jeannette. By the time I was old enough to understand this, most of these Italian relatives were either dead or living far away. I know their names and had seen their black-and-white faces in old photographs, but those didn't mean anything to me. Campania was as about as remote as Jeannette must have seemed to the generations before mine. But as it turned out, we had a lot in common. We shared my mother, my grandmother, and food. I didn't know it, but I was more Italian than I was southerner. When I first moved to Memphis at the age of nine, I found the practice of eating barbecue ribs with baked beans and cole slaw to be the depths of bad taste. We didn't eat such things. We liked zucchini, fried eggplant, gnocchi (pronounced nuh-yawk-ee), chicken parmesean, Italian spinach, pizza, Syrian pizza, and calzone. For Easter we had pizza chiena and homemade manicotti (Mom still makes her own crepes). Christmas Eve dinner was angel hair pasta with anchovies, fried fish, pizelles, and cheese fondue. We didn't just eat Italian food, though. There were as many Poles as Italians in Pittsburgh, and much of my favorite food is Polish. We still eat kielbasa, bratwurst, perogies, sauerkraut, cabbage and dumplings, and "Polish hand grenades," cabbage leaves stuffed with ground beef and onions and sometimes covered in a citrusy glaze. The cheese fondue may be a hanger-on from trendy 1970s cuisine, but the rest is a part of a precious family history that informs not only what I choose to buy at the grocery store, but who I am on a more important level. I didn't realize this when I was young, of course. It didn't matter to me then. Eggplant tasted good; okra was gross. It matters more than ever now. My wife and I had our first child in 2008. We named him Rocco, a nod to the Italian heritage that grows more distant with each generation. When he was old enough for solid food, my mother instinctively made him a meal that I hadn't seen in twenty-five years—a cupful of pastine tossed in butter and a little parmesean cheese. He loved it. On the gray morning that I was to leave Kirkland, Washington last summer, I crept quietly out of my sister's house with an unfamiliar butcher knife in hand and chopped about fifty stalks of a red, celery-like plant so that I could cram way too much of it in my suitcase and have an endless supply of it in Memphis. Yes, I am obsessed with rhubarb, the tart, citrus-y, now-in-season treat that I plan to bake and bake until I can't even bear to look it again. My sister, she of the entire front-and-side-yard vegetable garden, shrugged the night before when I asked if I could liberate some of it. "Sure, take as much as you want," she said. "I like it, but there's no possible way for me to figure out how to use all of that." As I close my eyes and picture this crazy plant, I remember it being about three feet wide, almost like a bush or even a trunkless tree. Finally, I have planted rhubarb in my own garden this year, and I am desperate for it to start growing. 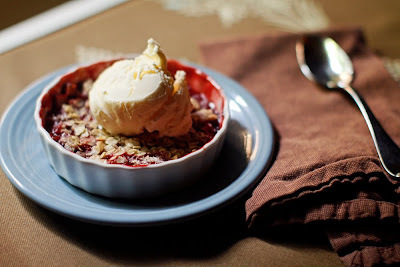 For now, I am mixing it up with strawberries in this crumble. Preheat oven to 350 degrees. Mix all the fruit ingredients and set aside to macerate. Stir together all the dry ingredients along with the small chunks of olive oil margarine. Place fruit mixture into a baking pan or small shallow dishes, either of which should be brushed with a little olive oil or margarine. Spoon on the crumble topping to cover. Top with pinches of salt and a generous drizzle of olive oil. Bake for about 30-40 minutes until mixture is bubbling and crumble topping is golden brown. Let cool and top with vanilla ice cream or honey-sweetened Greek yogurt. Seriously -- this show rocks. We really liked it, but then a seemingly premature wrap-up last week left us feeling a little bereft. We wish there was more show! Anyway, here's the link to the Food Revolution episodes; they are definitely worth watching today if you're stuck in this weird, siren-punctuated storm just like we are. Inspired by the vegetable-y, but still basically meat-based ones that Jaime served at a Huntingdon, West Virginia school cafeteria, we recently made our own vegan sloppy joes. They were a hearty and great way to eat a bunch of vegetables. Sauté the mushrooms in a few tablespoons of olive oil until browned and liquid has evaporated. Remove from pan and set aside. In the same pan, sauté the onion and the bouillon cube until onion is translucent. Deglaze the pan with white wine. Add the carrots, celery, and bell pepper. Cook on medium until carrots have softened -- about 5 minutes. Return mushrooms to the pan with the vegetables and add all remaining ingredients. Turn heat to low and stir and heat the mix through. Salt and pepper to taste. Spoon onto warmed Kaiser rolls and have some napkins ready.